This course includes instructional areas designed to provide an understanding of the fundamental marketing processes and the role of marketing in a free enterprise economy. Demonstrate Knowledge of Marketing Education and Cooperative Procedures. 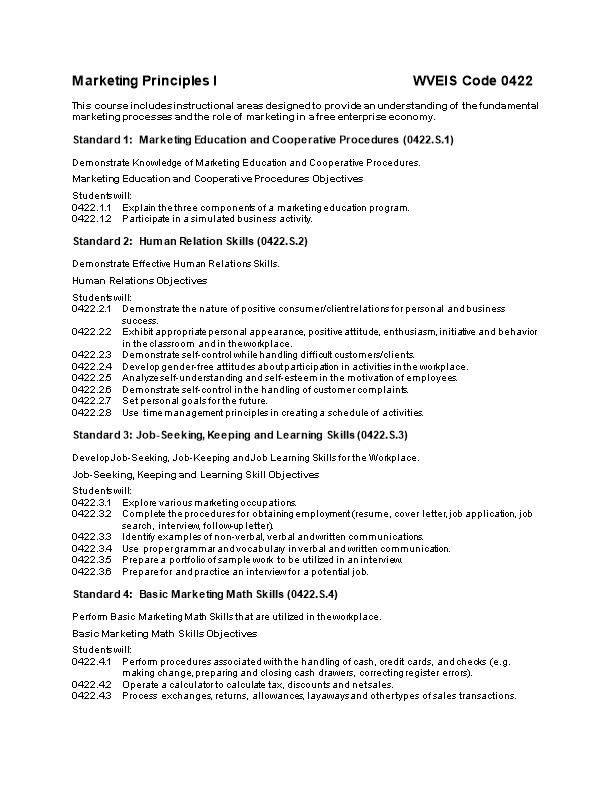 0422.1.1Explain the three components of a marketing education program. 0422.1.2Participate in a simulated business activity. Demonstrate Effective Human Relations Skills. 0422.2.1Demonstrate the nature of positive consumer/client relations for personal and business success. 0422.2.2Exhibit appropriate personal appearance, positive attitude, enthusiasm, initiative and behavior in the classroom and in the workplace. 0422.2.3Demonstrate self-control while handling difficult customers/clients. 0422.2.4Develop gender-free attitudes about participation in activities in the workplace. 0422.2.5Analyze self-understanding and self-esteem in the motivation of employees. 0422.2.6Demonstrate self-control in the handling of customer complaints. 0422.2.7Set personal goals for the future. 0422.2.8Use time management principles in creating a schedule of activities. Develop Job-Seeking, Job-Keeping and Job Learning Skills for the Workplace. 0422.3.2Complete the procedures for obtaining employment (resume, cover letter, job application, job search, interview, follow-up letter). 0422.3.3Identify examples of non-verbal, verbal and written communications. 0422.3.4Use proper grammar and vocabulary in verbal and written communication. 0422.3.5Prepare a portfolio of sample work to be utilized in an interview. 0422.3.6Prepare for and practice an interview for a potential job. Perform Basic Marketing Math Skills that are utilized in the workplace. 0422.4.1Perform procedures associated with the handling of cash, credit cards, and checks (e.g. making change, preparing and closing cash drawers, correcting register errors). 0422.4.2Operate a calculator to calculate tax, discounts and net sales. 0422.4.3Process exchanges, returns, allowances, layaways and other types of sales transactions. Describe the Fundamentals of Marketing. 0422.5.1Define the role of marketing and its importance. 0422.5.2Explain the functions of marketing. 0422.5.4Describe the economic benefits of marketing. 0422.5.5Identify the 4 P’s of the marketing mix. 0422.5.6Illustrate the use of product positioning. 0422.5.7Analyze variables in the consumer and industrial market (demographics, geographics, psychographics) that determine the target market. Apply and Demonstrate Basic Safety Techniques. 0422.6.1Demonstrate basic safety rules relevant to job safety by reading the appropriate operating instructions and explain the role of OSHA. 0422.6.2Describe the first aid measures to be used in case of an emergency on the job, along with the procedures to be followed in case of an accident. 0422.6.3Classify type A, B, and C fires and describe characteristics in order to extinguish properly. 0422.6.4Discuss appropriate practices for handling and storing hazardous materials. 0422.6.5Explain the role of OSHA. Apply the Principles of Selling. 0422.7.1Identify the steps in the selling process. 0422.7.2Identify the different approaches in the sales process. 0422.7.3Identify the different methods of closing a sale. 0422.7.4Choose the proper method of determining needs and handling objections in closing a sale. Analyze Consumer Characteristics and Behaviors as They Relate to Marketing Goods and Services. 0422.8.1Categorize buying transactions according to buying motives. 0422.8.2Discuss how customers make buying decisions. 0422.8.3Analyze external influences on the consumer buying decision. Describe the Importance of Economic Principles in Today’s Society. 0422.9.1Identify the various measurements used to analyze the economy. 0422.9.2Distinguish between economic wants and needs. 0422.9.3Define economic goods and services. 0422.9.4Identify the resources (factors of production) that are used to satisfy wants and needs. 0422.9.5Explain how scarcity affects the availability of economic goods and services. 0422.9.6Explain the benefits of competition. 0422.9.7Identify the opportunity costs and trade-offs involved in making choices. 0422.9.8Explain the effects of the business cycle on consumers, businesses and government. 0422.9.9Explain what an economy is. 0422.9.10Discuss advantages and disadvantages of different types of economic systems. 0422.9.11Discuss how an economic system addresses the questions (what is to be produced, how it is to be produced, and for whom). 0422.9.12Analyze the relationship of price to scarcity. 0422.9.13Describe how prices affect buying and selling decisions. 0422.9.14Graph the concept of price on a supply and demand curve. Discuss Business Ethics and Social Responsibility. 0422.10.1Explain the basic functions of a business. 0422.10.2Name the areas in which businesses are thought to have social responsibilities. 0422.10.3List ways that business activities have impacted the environment. 0422.10.4Suggest how marketers can make ethical choices. 0422.10.6Describe current trends that are likely to improve the workplace for employees. Discuss the Importance of International Trade to Nations. 0422.11.1Distinguish between imports and exports. 0422.11.2Discuss the interdependence of nations. 0422.11.3Explain the advantages and disadvantages of international trade. 0422.11.4Discuss the U.S. balance of trade. 0422.11.5Identify trade barriers, trade support and trade agreements. 0422.11.6Analyze how cultural, economic and political factors impact businesses engaged in international trade.